Bonchevite: Mineral information, data and localities. Named in 1958 by Ivan Kostov in honour of Georgi Bonchev [August 6, 1866, Zheravna, Kotel, Bulgaria - March 7, 1955, Sofia, Bulgaria] systematic mineralogist and professor at University of Zagreb and for most of his career at University of Sofia, Bulgaria. Bonchev received many academic honours and was also proficient in gemmology and geoarcheology. Fleischer (1958) compared the x-ray pattern of bonchevite to those of galenobismutite and "bismuthinite" and noted their similarities. Nechelyustov and Lebedev (1967) described a "bonchevite" from Kara-Oba, Kazakhstan with x-ray and chemical data similar to Bulgarian bonchevite. Craig (1967) discovered that phases in the PbS-Bi2S system exsolved to a mixture of "bismuthinite" and galenobismutite. Kupcik et al. (1969) studied topotype bonchevite and found their specimen was a mixture of galenobismutite and a member of the andorite group. 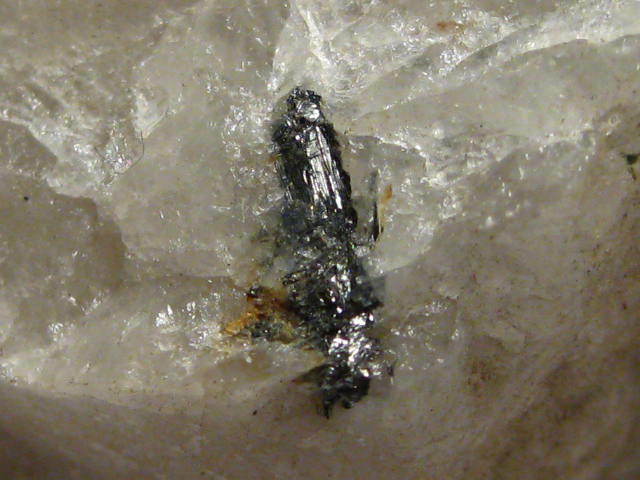 Bonev (1982) identified the unknown Kara-Oba mineral as lillianite. Birch and Mumme (1985) also studied a mineral they collected "from a vein north of Nahrechen" and they concluded their specimen was pekoite - "No inclusions were observed." Birch and Mumme (1985) concluded that a near equal mixture of pekoite and galenobismuthite would yield the reported chemical composition reported for bonchevite and by extension that the mixture was possibly a homogeneous phase that exsolved into the two phases that were consistently observed in synthetic and natural specimens. This page provides mineralogical data about Bonchevite. May show patchy blue to blue iridescence, etc. Quartz 3 photos of Bonchevite associated with Quartz on mindat.org. Kostov, I. (1958) Bonchevite, PbBi4S2, a new mineral. Mineralogical Magazine: 31: 821-828. Fleischer, M. (1958) New mineral names. American Mineralogist: 43: 1221-1222. Craig, J.R. (1967) Mineralium Deposita: 1: 278-306. Nechelyustov, G.N. and Lebedev, V.S. (1967) Dokl. Acad. Nauk SSSR: 174: 679. Kupcik, V., Franc, L., and Makovicky, E. (1969) Tschermaks Min. Pet. Mitt. : 13: 149. Bonev, I. (1982) Excursion Guide (Central Rhodopes), 13th General meeting of the IMA, Varna, Bulgaria, p. 22. Birch, W.D. and Mumme, W.G. (1985) Pekoite from Narechen, Bulgaria - a possible solution to the bonchevite problem. Mineralogical Magazine: 49: 135-137. Burke, E.A.J. (2006) A mass discreditation of GQN minerals. The Canadian Mineralogist: 44: 1557-1560. Birch, W.D. and Mumme, W.G. (1985) Pekoite from Narechen, Bulgaria―a possible solution to the bonchevite problem. Mineralogical Magazine, 49(1), 135-137.